Diwali this year in Bombay has been slightly muted with a blanket of security and restrictions in areas that President Obama plans to visit. We usually go for dinners in South Bombay as it is closer to home but last night we crossed the sea link and went to the Salt Water Cafe in Bandra. Salt Water Cafe has an all day menu, a deli selling meats, cheeses, bread and desserts. The name can be misleading as it is not a seafood restaurant. The food is European in style and flavour. The space is laid back and has an italian cafe like feel with clean lines of wooden tables and benches cast on site, wooden flooring and contrasting textured walls. Large windows facing the street level give an expansive view of the busy street side. A two level space with casual seating and bakery at street level, a bar in the middle and a terrace with tables for two makes a perfect place for a date. 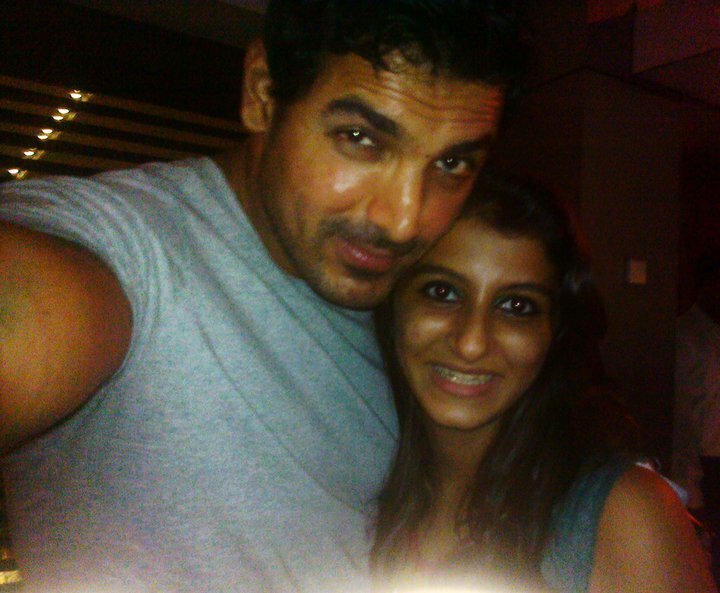 As we arrived I spotted Bollywood actor John Abraham dining with friends. My mom and sister made sure that they had a clear view of Abraham as they took their seats. The cafe has an extensive menu of cocktails and drinks but I chose to stick to water this time, the rest of my family went for lemon and peach ice teas. For appetizers we called for roasted spice jerk potatoes that were accompanied by a cold cheese and pepper sauce, the coldness of which complemented the potatoes well. We also got polenta crusted chicken with chilli sauce, the chicken was definitely crispy but not as appetising. For the main course I ordered a pan seared John Dory with capers and a sun-dried tomato and sunflower seed risotto. The fish was cooked perfectly as every bite was juicy and the risotto was just the way I like it – comforting and not too creamy. Dad and grandma ordered fish n chips burger with mayo sauce. Dad felt that burger was good but would have been better with a more generous helping of mayo. Salt Water Cafe’s predecessor at Chowpatty called Salt Water Grill(now shut) had a Brazilian Steak on their menu that has been raved about so mom went in hoping to find that on the menu, she was disappointed to find out that they no longer served the steak. She settled down for the tenderloin cooked in-house spices, which was tender and juicy and crusted in sesame seeds. My brother had 8hr braised and slowly cooked australian lamb shanks which hands down was the best dish. Every bite was juicy and tender, also the meat separated from the bone easily. My sister in her excitement of getting a photo-op with Abraham ended up ordering a dish that was not as fancy as the rest, she got the chicken salami sandwich accompanied by a pineapple salsa sauce. Their dessert line up was impressive so we ended up ordering the crème brûlée of the day which was a dark chocolate crème brûlée well crusted and garnished with grapes and sweet lime wedges. We also had a perfectly baked cheese cake with a raspberry compote, a hazelnut mousse cake and a flourless chocolate cake with some caramel crunch ice cream. The desserts definitely took the cake and left us more than satisfied. Besides the slow service, everything else was perfect. The experience was irresistibly delish. I look forward to going back – it was fun to go with the family but next time around with friends and hopefully I will dive into their extensive drinks menu. This entry was posted in Fashion, Food, Travel and tagged Bandra, Bombay, Cafe, Diwali, Festival, Food, John Abraham, Travel. Bookmark the permalink.